Drivers who park irresponsibly outside Ealing schools could be given penalty charge notices. 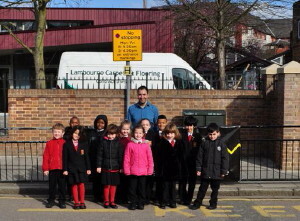 The council will be taking enforcement action against anyone parking on zig-zag road markings outside schools. Local police safer neighbourhood teams will also visit the schools to move on vehicles blocking the area. Although yellow zig-zag road markings outside schools are there to provide a clear space for children to cross where they can see traffic and traffic can see them, some motorists put children in danger by parking on them. The road safety campaign is taking place at 30 schools in the borough which will display banners outside their buildings and give out leaflets to parents and carers reminding them that it is illegal and dangerous to block the ‘school keep clear’ area. Council civil enforcement officers will step-up patrols at the schools and issue fixed penalty notices of £110 (reduced to £55 if paid within 14 days from issue) to anyone parking on the zig-zag lines. Councillor Bassam Mahfouz, cabinet member for environment and transport said: “Children’s safety is priority and I will not tolerate anyone who endangers a child by parking selfishly and illegally at our schools. I hear far too many horror stories about near misses from worried teachers and parents, and I have seen for myself some terrible examples of dangerous parking at schools.